We believe in sharing our knowledge so that you can make the best, most informed decisions when choosing a diet for your pet. 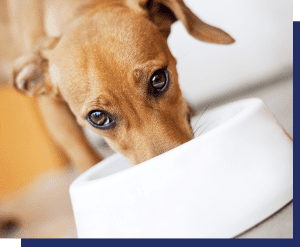 We are confident that once you become familiar with the wholesome goodness of our products you will find that Stewart® food and treats are the right choice for every stage in the life of your pet. You asked. We answered, but if you need anything else please contact our friendly customer care team. Traditional heat processing destroys enzymes and lessens the nutritional value of otherwise wholesome food. Our raw diet is cold pressure pasteurized in a human grade USDA/FDA facility using high pressure processing (otherwise known as HPP). Science has shown that harmful bacteria cannot survive under high water pressure associated with deep sea levels. HPP applies this science as a completely natural process using cold water under very high pressure (up to 87,000 pounds per square inch) to destroy micro-organisms that cause spoilage, while maintaining the complete nutritional value of food. How does HPP affect food? HPP affects the cell walls of harmful bacteria. Harmful bacteria are single-cell organisms that are destroyed at high pressure by rupturing the cell walls. HPP does not affect the molecular structure of food. Molecules include proteins, enzymes, nutrients, vitamins and minerals. Because they are not affected there is little or no impact to nutritional value or flavor. As for appearance, many think that at such high pressure food would be crushed. This is not the case. During HPP, pressure is uniformly applied around and throughout food which prevents crushing. As an example, a piece of fruit held in your fingers can be easily squeezed and crushed because pressure is not applied evenly from all sides at the same time. If the same piece of fruit is squeezed from all sides simultaneously, it will not be crushed. HPP is USDA-approved, 100% natural and can be used on organic and natural products without compromising the integrity of nutrition. Take a look at some of our helpful videos that help illustrate our products and their benefits to your pet!